Feedback is welcome - Let me know if anything is missing! This strip is a reply to Tutorial - Chicken, Stuck - 47, Theme Pack Contest, SG for DUMMIES Contest! 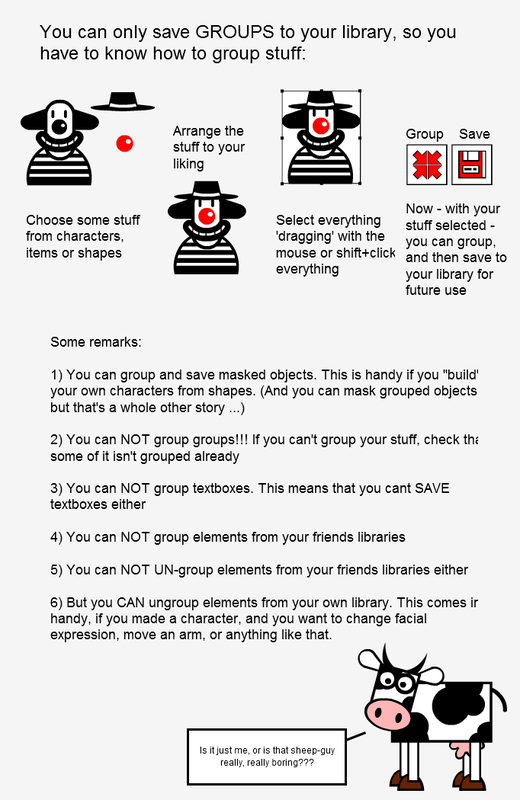 6) But you CAN ungroup elements from your own library. This comes in handy, if you made a character, and you want to change facial expression, move an arm, or anything like that. Is it just me, or is that sheep-guy really, really boring??? @mau - you are probably trying to save some elements along with something already grouped. I am having trouble saving a masked object. The SAVE and GROUP buttons are greyed out. Any Ideas anyone? Really stuck on this one. These are such cool and subtle tools...thanks for re-sharing! Awesome tutorial! And it's just the cow, sheep. You are not boring. My group icon is not active when i select items to group them! Help?? Good tutorial, I think this will really help anyone who isn't sure, well done!